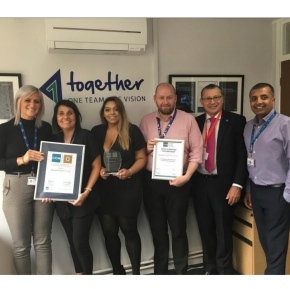 Aggregate Industries has announced that it has achieved the Chartered Institute of Credit Management’s ‘quality accreditation’, having received the accreditation consecutively since 2010. The CICMQ accreditation is formal recognition of Aggregate Industries’ commitment to quality, continuous improvement and best practice within its Credit Services team. Aggregate’s Credit Services team is made up of 34 full-time employees (including three apprentices) and is responsible for handling inbound payments, allocation, credit risk, cash collection and legal for the company. Apprentices within the Credit Academy were tasked with organising this year’s re-accreditation, which included an assessment process on the team’s approach to credit policy, compliance, customer service, staff development, monitoring performance and roadmap and stakeholder management. In addition, the apprentices had the opportunity to present their experience at the CICMQ best practice event as a result of the process and accreditation.